Aspirin Regular Strength provides fast and effective relief of headaches, fever, the pain and discomfort of colds and flu, pain of inflammation, arthritic or rheumatic pain, minor aches and pain, pain due to muscle sprains and strains, joint and body pain, pain of menstrual cramps, toothache and pain of dental work or intervention. 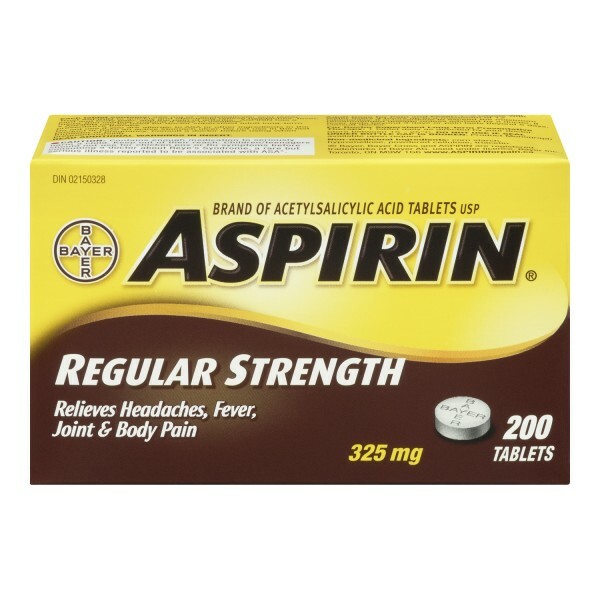 Aspirin is also for doctor supervised long-term preventative therapy. Medicinal Ingredients: Acetylsalicylic Acid (325 mg). Non-Medicinal Ingredients Corn Starch, Hypromellose, Powdered Cellulose, Triacetin. For Adults and Children 12 years of age and older: Take 1-2 Aspirin Regular Strength tablets with milk or water every 4 hours as necessary, up to a maximum of 12 caplets daily. If these doses do not bring relief of pain or fever, or fever lasts beyond 3 days or pain lasts beyond 5 days, consult doctor. It is hazardous to exceed the maximum recommended dose unless advised by a doctor. Children under 12 Years of age: Consult your doctor. 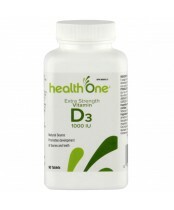 For doctor supervised long-term preventative therapy: Take 1 caplet daily as directed by your doctor. If you forget to take your medication, take it when you remember. But do not take extra medication to compensate for a missed dosage unless instructed by your doctor. Cautions: Keep out of reach of children. Aspirin should not be used if you are allergic to ASA or any ingredient within the formulation, have an ulcer, have a history of asthma caused by salicylates or other anti-inflammatory drugs, are using methotrexate at doses of 15 mg/week or more, are in the last trimester of pregnancy because it may cause problems in the unborn child or complications during delivery, are prone to bleeding, or have severe liver/kidney/congestive heart failure Call your doctor if you experience: nausea, vomiting; stomach irritation, ringing or buzzing in the ears or pain; if you notice that you are ‘bruising' more easily than you were before starting a daily dose of Aspirin. Regular daily use of alcohol while on Aspirin daily therapy may increase your risk of developing gastrointestinal bleeding. Stop use and call your doctor if you experience an allergic reaction (skin rash, hives, itching, swelling of eyes, face, lips, tongue, or throat, wheezing or breathing difficulties); stomach bleeding (bloody vomit, vomit that looks like coffee grounds, bright red blood in stools, black or tarry stools); loss of hearing or bleeding. This is not a complete list of side effects. For any unexpected effects while taking Aspirin, contact your doctor or pharmacist. In case of overdose call a doctor or poison control centre immediately, even if there are no symptoms.